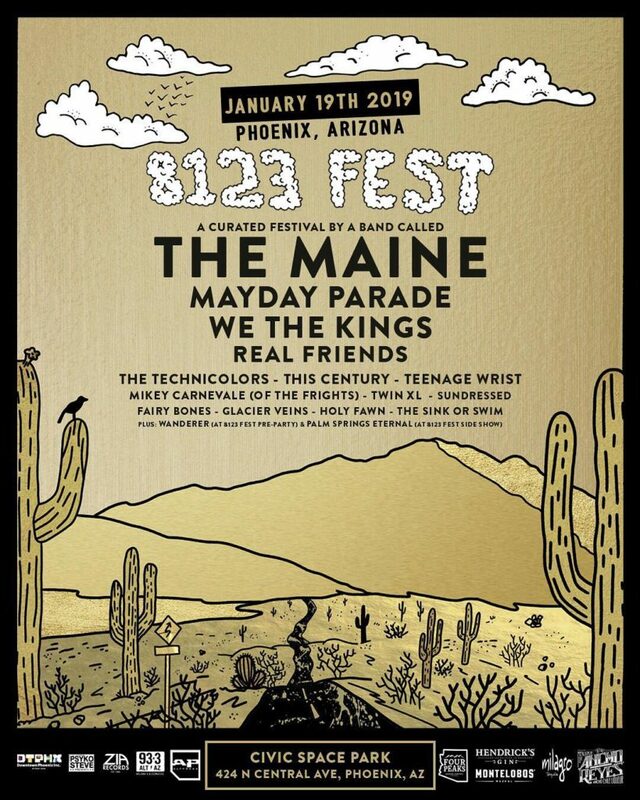 For the second year in a row, 8123 Festival is going to take over a desert in Phoenix, AZ and fill it full of the (Un)Lost and F**cked Up Kids. A band called The Maine is celebrating the tenth anniversary of their debut album Can’t Stop Won’t Stop, playing it in full for the first and last time and bringing along an entire lineup of bands that they’ve toured with over the years in order to bring fans a day stacked with entertainment. The lineup features acts like Real Friends, Mayday Parade, and We The Kings to satiate all of your pop punks needs both nostalgic and modern, but it also features a variety of hidden gems throughout the day. Glacier Veins are a dream punk band out of Portland, OR that are sure to dazzle those observing their 3:30 Desert Stage set. Having played with acts like Basement and various festival dates such as Vans Warped Tour and Bled Fest over the last year, you can expect nothing but a seasoned performance from the trio. Check out their music video for their single “Circles” and keep up with them on Facebook! Phoenix, AZ counterparts, Sundressed add to the festivals good vibes with their uplifting and catchy punk melodies to help inspire patrons. With 8123 and Noise Pop Music and Arts Festival already announced for this year, Sundressed is set to kick of 2019 with more forward momentum than ever before. Fans of Saves the Day, Transit, and sunshine will enjoy bopping along to their debut LP A Little Less Put Together. Check out their music video for “So Poetic” below and be sure to catch their 4:30pm Desert Stage set! Another set of Phoenix rockers, Fairy Bones, are set to ignite the Desert Stage. Bold, energetic, and unashamed, you can expect nothing short of a wild ride alongside this act. With their “Pixies-meets-Weezer” sound, Fairy Bones are here to talk about anxiety and societal pressures, but with a catchy and facetious twist. Their sophomore album 0% Fun was released in early 2018 and is available across all music platforms; you can check out their music video for “I’m Fine” below. Make sure to catch them lighting up the Desert Stage at 2:40pm! After deciding to part ways to chase individual musical endeavors in 2015, Phoenix’s own This Century is going to be gracing the stages again as a full band for 8123 Fest. Taking over the Maine Stage at 2:10, you can expect pop rockers to lose their mind over this set. Having had shared the stage with the likes of Selena Gomez, Good Charlotte, and Yellowcard, This Century is no stranger to putting on a larger than life performance. They will also be performing an official side-show at the Crescent Ballroom the night after the festival, where they will be playing their debut album Sound of Fire in full alongside their other smash hits. You can check out “Sound of Fire” below! So get your playlists made for your travel out to the desert and get ready to dance non-stop for one day of wonder alongside The Maine and these talented performers. Tickets are still available here and will be available day of the festival at the box office. 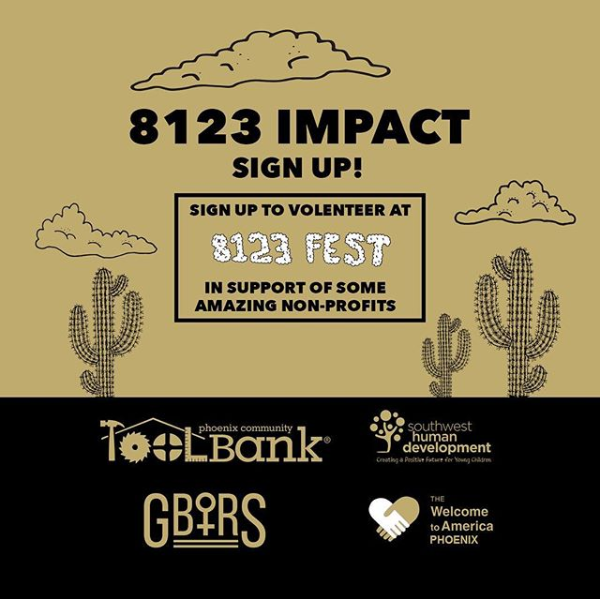 And while you’re at the 8123 be sure to stop by and check out the #8123Impact non-profits that will be set up at the festival, Girls Behind The Rock Show will be set up there selling merch and handing out flyers! Get ready to get (Un)Lost!